New study shows Oregon leads in green jobs. 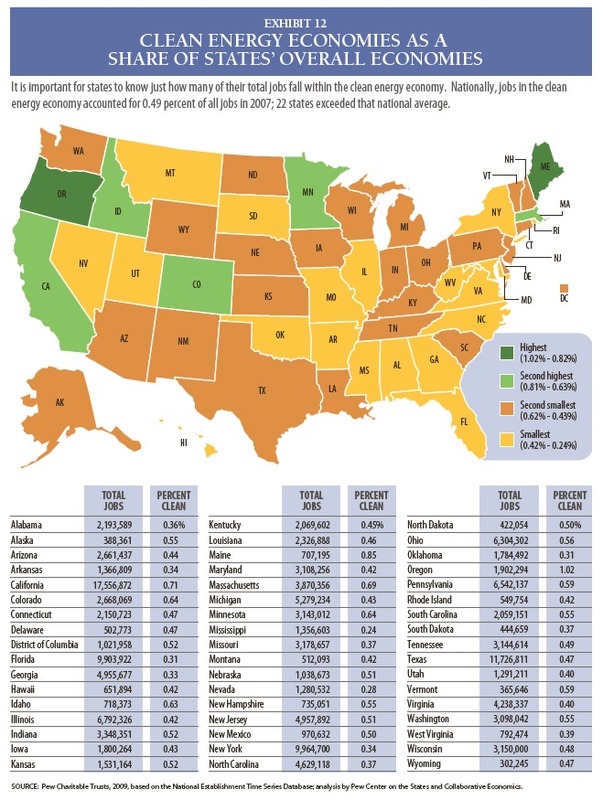 True—it’s a small chunk (1.02 percent of the 1.9 million jobs in the state), but it shows that the state has claimed a lead in the transition to the new energy economy. Idaho also ranked well, in the second tier with .63 percent of its jobs being green. Washington didn’t fare quite as well—only .55 percent of its 3.1 million jobs. A clean energy economy generates jobs, businesses and investments while expanding clean energy production, increasing energy efficiency, reducing greenhouse gas emissions, waste and pollution, and conserving water and other natural resources. Efficiency; (3) Environmentally Friendly Production; (4) Conservation and Pollution Mitigation; and (5) Training and Support. See the NYT blog piece on it, and the report itself (pdf). Thanks to Stephanie & Stephen Nowers for supporting a sustainable Northwest.